In collaboration with the Berliner Ensemble, KW Institute for Contemporary Art presents the public workshop Hier wird heute Abend ein Mensch wie ein Auto ummontiert / Ohne dass er irgendetwas dabei verliert. Brecht in der Autowerkstatt by Olaf Nicolai. 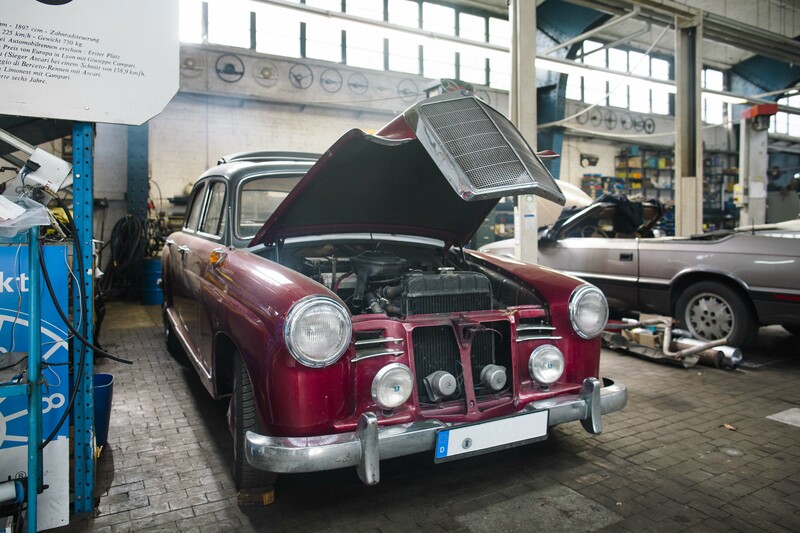 This workshop will show the assembly and repair of a Mercedes-Benz Ponton, which once belonged to Helene Weigel, the former intendant of the Berliner Ensemble and Bertolt Brecht’s wife. At the same time, Brecht’s learning play Man Equals Man will be developed with actors. Here, questions will be raised about the nature of performance and theater as well as the meaning of labor in the context of contemporary economics and art production. The garage visits are structured in traditional shifts and enable exciting insights into labor at various levels. The project is a collaboration between KW and Berliner Ensemble and is funded by the Schering Stiftung.